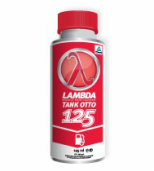 Lambda Tank Otto is a professional product designed for fuel tank application in Petrol vehicles. Tank Otto removes gums, tars, varnishes, laquers and carbons which build up in fuel lines, injectors, intake valves and compression rings between extended service intervals. It restores lost engine efficiency, reducing emissions and restoring lost performance.